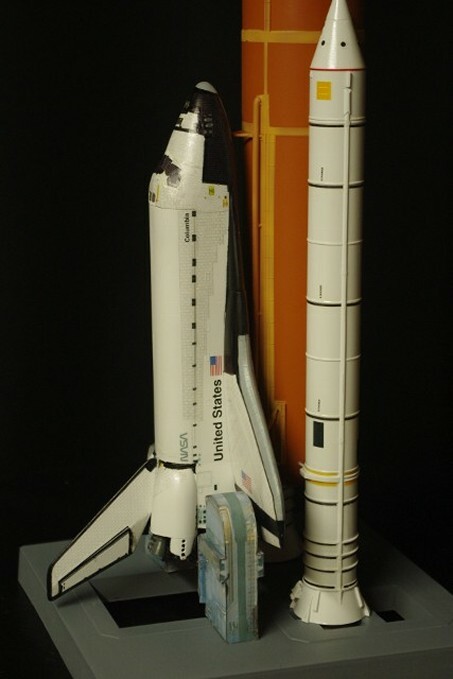 Back in late 1981, I built my first 1/144 scale Airfix Space Shuttle "stack," specifically to be placed onto the 1/144 scale Launch Complex 39 model. 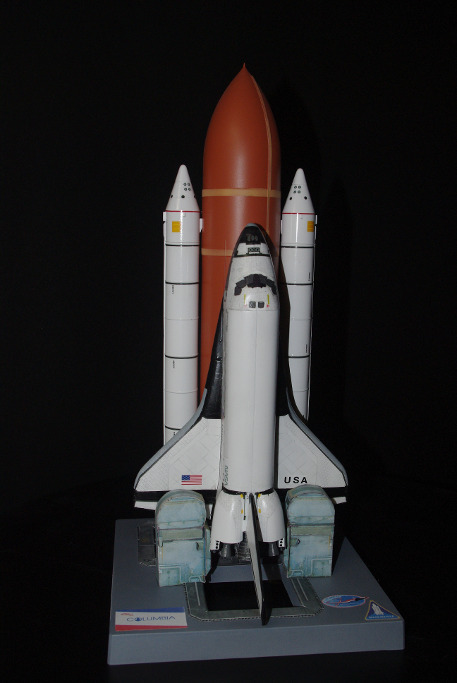 I was in the process of building that scratch-built model from the photos of the trip to witness the launch of STS-1. 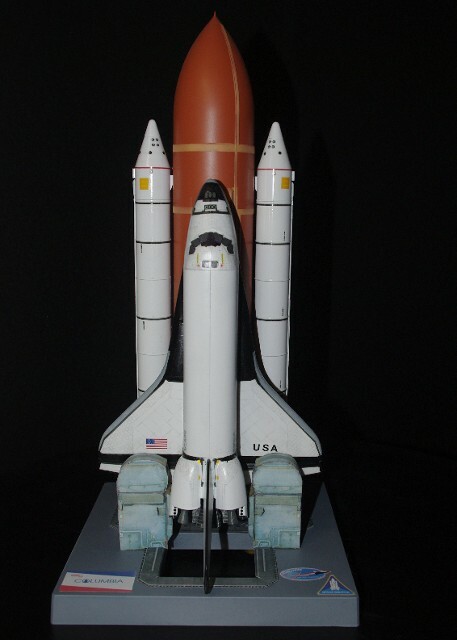 After returning from our second trip to witness a Shuttle Launch in 1982, I built a second Airfix 1/144 scale stack in the livery of STS-4, Columbia's fourth trip into space and the "last" of the Orbital Flight Test series. 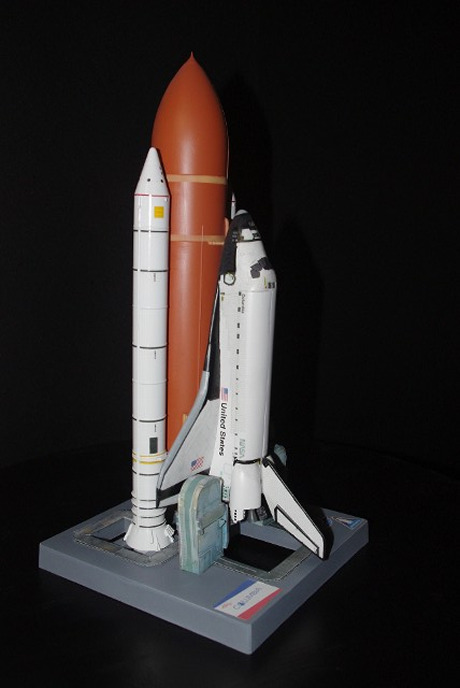 Years later, when I joined UL, I gave the STS-4 stack model to the gentleman I interviewed with, and from whom the hiring recommendation was given, as a token of both gratitude and respect. it seemed the right thing to do at that time. 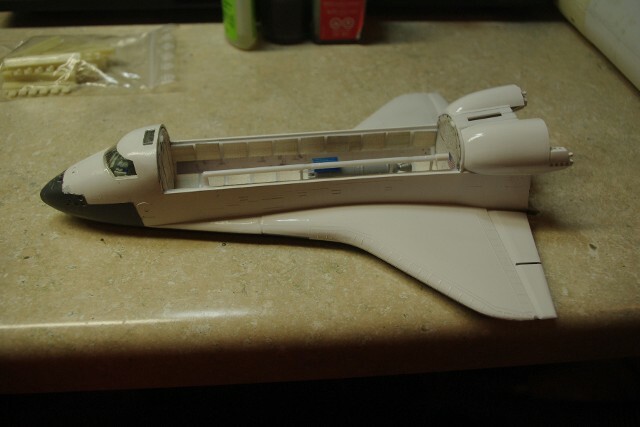 Recently, I purchased a Minicraft 1/144 scale Space Shuttle Stack model, mostly in order to determine whether or not our Shuttle Payload Bay Detail Set would work for the Minicraft model as it did in the Revell 1/144 scale model. It did, and we took a series of photos of the installation and amended the instruction manual for the 1/144 scale Shuttle Payload Bay Detail Set to include the Minicraft model specifics. 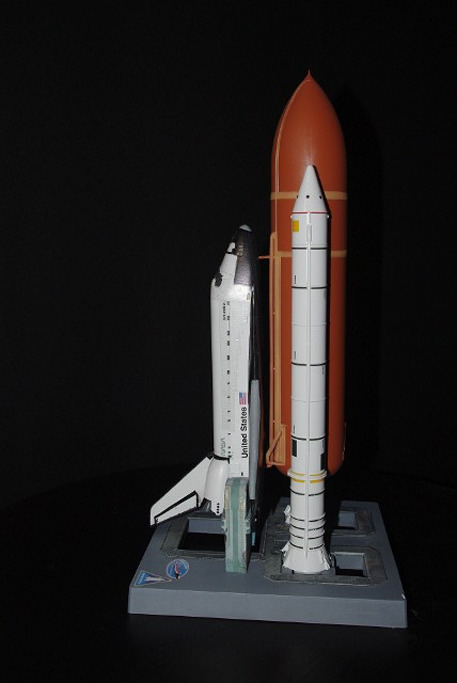 After that, we needed to complete the model, and it seemed an appropriate time and circumstance to replace our STS-4 model of years ago. 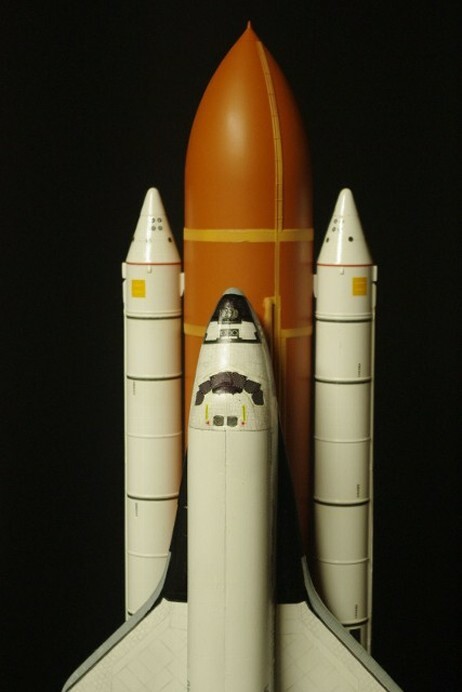 The biggest "problem" areas on the Minicraft Shuttle model is the fact that much of the model's detail came from very early drawings of the Space Shuttle, and have not been revised to get "in step" with the vehicle as it has been flown. The cockpit windshield has too great a slope, the orbiter nose is not rounded enough and there are some detail shortcomings on the External Tank and SRBs. On the whole, however, it is very similar to those early Airfix models. In order to get rid of the slight payload bay door warp, I decided to fix them in the closed position for launch. 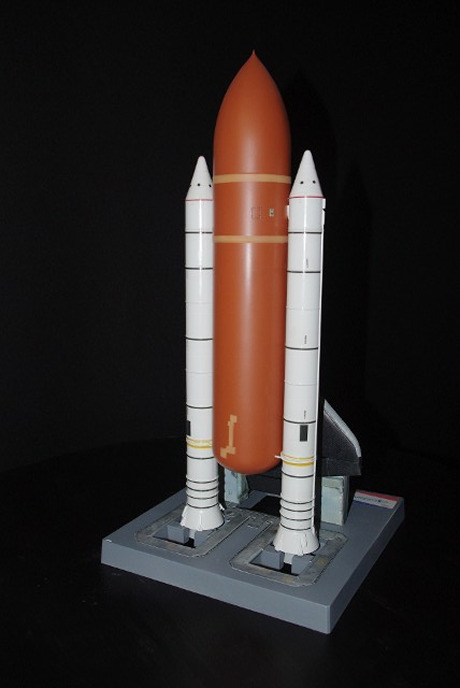 Using some of the supplied decals, along with our own Shuttle Tile Decals and Early Era Shuttle White Tile Decals, we did the entire scheme of Columbia, as she was poised for her fourth flight into orbit. We modified the Minicraft display stand by adding a set of reproduced Tail Service Masts, from the Edu-Craft 1/144 scale Shuttle MLP model to the display stand surface.